Click here to download ppt. 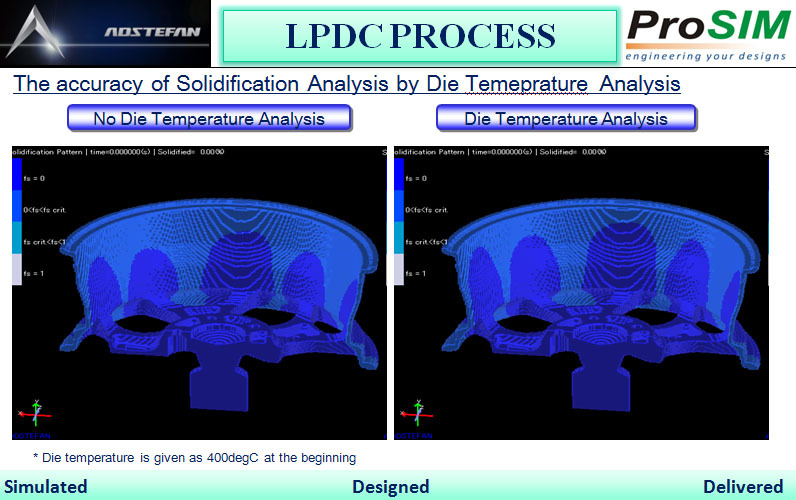 Gravity Die Casting (GDC) simulation is carried out using casting simulation software ADSTEFAN. 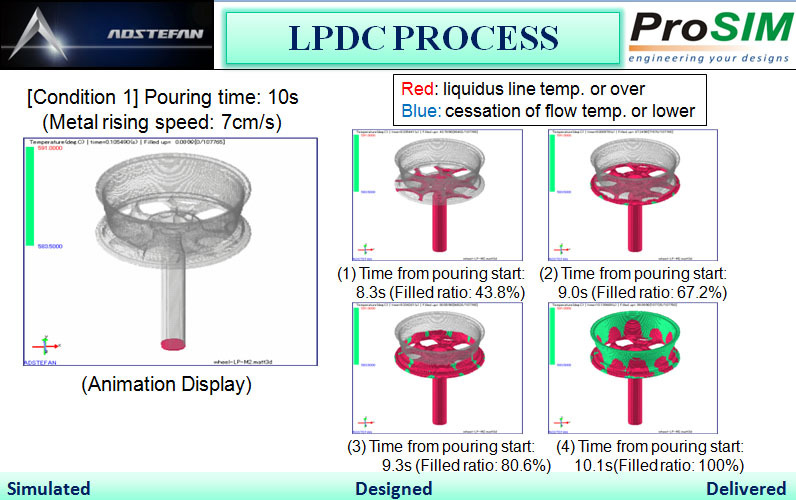 Key issues of die preheating, pouring temperature, location of vent pins, die channel cooling lines, connectors etc, in the gating / die design can be optimised using casting simulation. 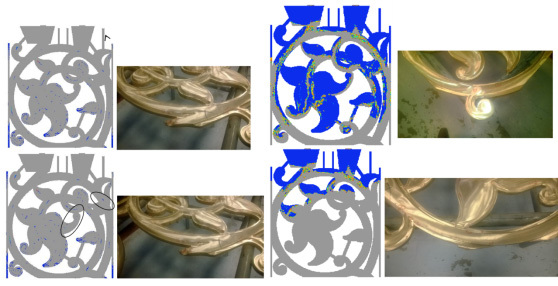 Figure above shows prediction of shrinkage porosity and air entrapment defects in a brass casting using GDC. Figure also shows the physical samples with casting defects. Figure above shows temperature distribution in the melt after the die cavity filling. It is observed that several regions in the casting are below the solidus temperature of the alloy, hence causing several defects including cold shut, and misrun. 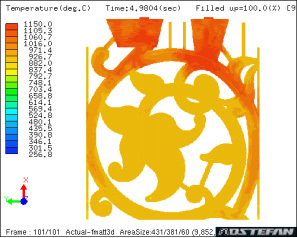 Based on the analysis after computer simulation of GDC, several changes to the die design were made as shown in the figure below. Connectors were provided in multiple regions. 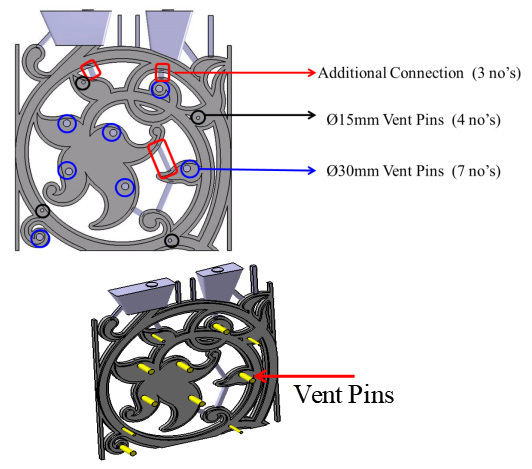 Vent pins were inserted in the die, die preheating temperature was reset. With all these changes excellent results were obtained. Yield was increased from 22% to 76%. As shown in figure above, temperature in the melt in the earlier design was highly non-uniform, with many regions lower than solidus temperature. In the modified design, achieved by die design optimisation of the gravity die casting simulation, we can see that the average temperature is more uniform, and temperature in the entire melt region in die cavity is much higher than the solidus temperature.